Hartland Electric offers a wide range of installation for both Commercial and Industrial electrical repair services. No two industries or facilities are alike, and power needs can vary greatly. We have knowledge across a broad spectrum of industries. We are an Eaton Certified Contractor, so electric fixtures and parts we use are of the highest quality in the electrical industry. We put our name and reputation behind every service and installation we perform and strive to exceed our customers’ expectations. Manufactured engineering gives us the unique ability to analyze any commercial or industrial project, plant layout, or equipment. We can then design and install the most efficient power structure and cabling for maximum productivity. Hartland Electric specializes in a variety of products and we can install and repair all types of electrical items in your commercial property to help your business run more efficiently. Energy Management Systems are computer systems designed and integrated specifically for the automated control and monitoring of significant energy consumption systems, such as heating, ventilation and lighting installations. Code Violations are electrical safety issues that are noted and written up on a city or township violation sheet either from a Building Code Official, Fire Marshall or Electrical Inspector. Commercial Generators restore the electrical supply to your business in the event that the utility power is interrupted due to severe weather or troubled transmission lines. Electrical Engineering Hartland Electric and our Electrical Engineers have the ability to provide accurate, quick, and cost effective designing services. 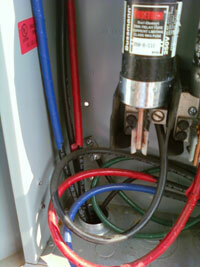 Electrical Inspections Let our Master Electrician perform your Electrical System Inspection. We can provide an Inspection that is recognized by many insurance companies, building code officials and mortgage companies. Explosion Proof Wiring Hazardous locations are defined as a place where concentrations of flammable gases, vapors, or dusts occur. 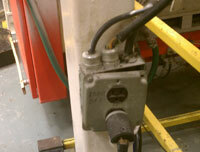 Explosion Proof Electrical equipment that must be installed in such locations. Equipment & Machine Hook-Ups For all your Large Equipment and Machine Hook-up needs! Specialty machines, generators, controls, automated systems, equipment power drops, process lines or buss ducts are no problem for Hartland Electric’s trained electricians. Efficient Lighting provides illumination and comes in many shapes and sizes, for a wide variety of uses, both inside and outside. Professional Low Volt Wiring refers to computer networking CAT 5/6 cabling or commercial telephone wiring. We can help provide an updated communication portal, allowing you to network more efficiently. 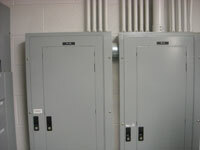 The Main Distribution Panel or switch gear is your supply point for all the electric circuits in your business. Advantageously locating Power Factor Correction devices throughout the facility can ensure and provide many benefits, including reduced electric utility bills, increased system capacity, improved voltage, and reduced losses. Save time, energy and money with a Service Contract Agreement. Place Hartland Electric on speed-dial and get a single point of contact to increase service delivery methods. Bucket Truck and Lift Services for your hard to reach lighted road signs, pole signs, and building signs are a method of displaying your company logo while allowing your customers a way to locate your building. Complete Surge Protection is provided using a piece of equipment that is designed to protect electronic devices from voltage spikes and power surges. Energy code compliance lighting control panels (with a scheduled automatic shut-off) remain the most cost-effective solution for energy code compliance in common areas such as lobbies, hallways, warehouse spaces, site lighting and signage.